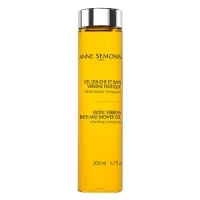 Anne Semonin Bath & Shower Gel Exotic Verbena is a gentle foaming gel which leaves skin refreshed, soft and moisturised. Enriched with Natural Sea Water and Seaweed Extracts Bath & Shower Gel Exotic Verbena is packed full of Marine Minerals and Trace Elements which help relax and detoxify the body. It's subtly perfumed with naturally scented oil of Litsea Cubeba, well known for its stimulating effects; this oil leaves skin feeling fresh and fragrant. Suitable for all skin types Anne Semonin Bath Shower Gel Exotic Verbena is mild enough for daily use.